On December 11 industry leaders converged on Global Green's Washington D.C. office for the Fourth Annual Sustainable Food & Beverage (F&B) Packaging Value Chain Meeting. The one-day meeting addresses the challenges | obstacles to sustainable F&B packaging. Elemental Impact (Ei) orchestrates the powerful annual meeting. Invites are extended to the trade association and non-profit executives who operate within the F&B packaging value chain. A BIG THANK YOU to Global Green for hosting the meeting in their shared office space. It was an honor Paul Walker who heads the D.C. office was in town and joined the meeting. Each year the meeting discussions exemplify the shifts and growth in an evolving industry. 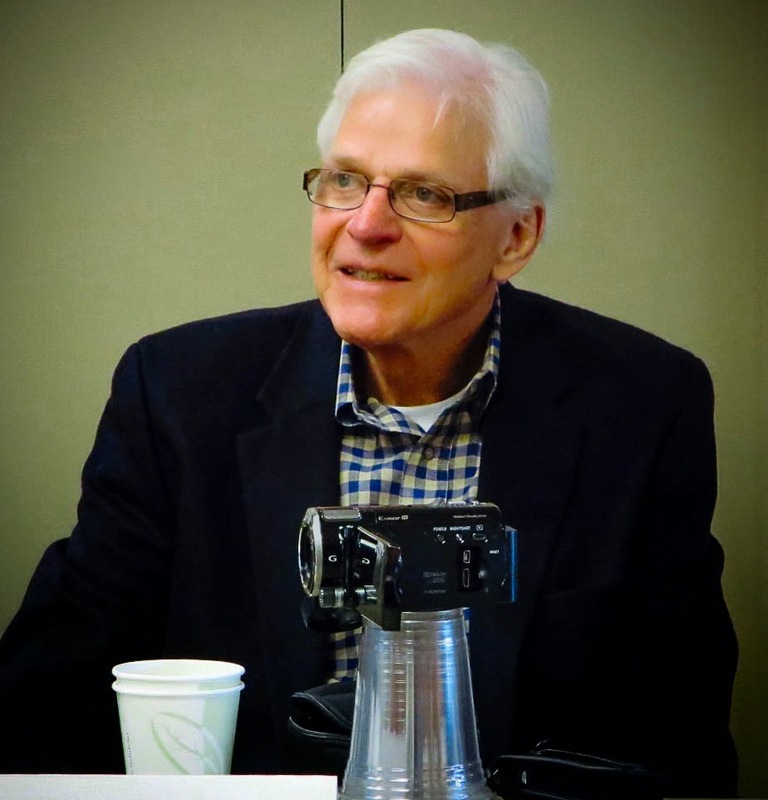 The ZWA Blog article, Tackling the Challenges | Barriers to Sustainable Packaging, is an overview of the 2013 meeting while Second Annual F&B Packaging Meeting, recaps the 2012 meeting. 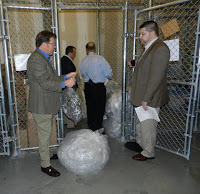 For a synopsis of the inaugural 2011 meeting, visit the ZWA Blog article, Sustainable Foodservice Packaging Meeting. Foodservice Packaging Institute (FPI) - represents single-use F&B packaging manufacturers. National Restaurant Association (NRA) - represents the F&B packaging purchaser who holds the power of consumer demand to effect change; foodservice operators bear the increased costs often inherent within shifting to sustainable packaging. U.S.Composting Council | American BioGas Council (USCC | ABC) - represent final destination options for post-consumer food waste and compostable packaging. Many meeting participants joined Ei Chair Scott Seydel for a pre-meeting dinner at GS certified Beacon Bar & Grill. Great food and lively, fun dinner conversation set the stage for the powerful meeting the following day. In the morning, each organization presented on their mission, stakeholders, 2014 activities and finished with planned 2015 projects. The meeting agenda, PPT presentations and attendee list are available for download on the Ei Meetings & Events page. Foodservice Packaging Recovery Toolkit - organized by sectors: communities, MRF (material recovery facilities) and end markets; includes an interactive map of end markets and case studies of successful foodservice packaging recovery. Foam Recycling Coalition - formed in 2014 to establish and fund proactive, multi-year grant programs geared to drive foam recovery & generate success stories; call for grant applications in early 2015 with grant announcements slated for spring 2015. Recycling & Composting Toolkit for foodservice operators slated for 2015 in partnership with the NRA. Paper Recovery Alliance | Plastics Recovery Group formed in late 2011 continue as the working groups behind FPI tool kit development, educational webinars and industry alliances for joint projects. 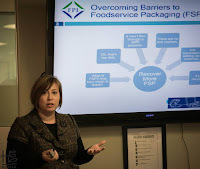 SPC Foodservice Packaging Industry Leadership Committee, launched in 2013, is working on a Design Guide that connects design with recovery. A supporting workshop is scheduled at SUSTPACK 2015. How2Recycle (H2R): Clear. Consistent. Concise, recycling labels that make sense - a voluntary, standardized labeling system that clearly communicates recycling instructions to the public; collaborating with BPI on incorporating composting into H2R label; consumer testing RFP (request for proposal) slated for release: McDonald's, Kellogg's, Wegmans & Honest Tea use the H2R labels on consumer packaging. Restaurant & Food Service Standard (GS-55) - requirements address the significant impacts of food services: sustainably-sourced food (options are local and environmentally preferable), waste minimization, use of environmentally-preferable products, and conservation of energy and water. Launched in 2014 with 10 restaurants certified. 2015 Goal: become more visible & increase publicity on certified restaurants. Food Service Packaging Standard (GS-35) - establishes environmental requirements for food-service food packaging, which includes single-use containers for packaging or carry-out of products from restaurants and other retail food service establishments. Greening Food & Beverage Services - a Green Seal Guide to Transforming the Industry; published in 2011 and continues as a valuable industry tool. State of Composting in the US; What, Why, Where & How published in April 2014 with contributions from Biocycle, Coker Composting & Consulting and University of Washington. Funded by the 11th Hour Project, the 131-page report reviews composting basics, provides national and state-by-state statistics and job generation data, summarizes model programs, technologies and systems, and concludes with recommendations on how to grow composting in the U.S. Growing Local Fertility: A Guide to Community Composting published in July 2014 in collaboration with the Highfields Center for Composting in Hardwick, Vermont the report profiles 31 model programs in 14 states and the District of Columbia. NRA Sustainability Report, Shedding Light on Sustainability, the NRA's first-ever sustainability report focuses on environmentally-stable trends and initiatives within the restaurant industry. The report presents the industry’s efforts to reduce waste and conserve resources through practices including composting, recycling, energy and water efficiency, and food donations. A second report is slated for February 2015 publication. Recycling & Composting Toolkit for foodservice operators slated for 2015 in partnership with the FPI. Composting & Food Donation Toolkit slated for 2015. Restaurant Litter Reduction Project with FPI & Keep America Beautiful underway. Guidelines for Sustainable Bioplastics provide a road map for the development and continuing improvement of biobased plastics throughout their lifecycle; The Guidelines reflect the current collective wisdom of a wide range of organizations who address the potential benefits and challenges of biobased plastics. BioSpecs for Foodservice Ware, Environmentally Preferable Specifications for Compostable Biobased Food Service Ware, define the criteria for manufacturers to determine the sustainability of their compostable foodservice ware; includes a sample bid document that purchasers may use when going to bid for compostable foodservice ware. The preceeding list exhibits the significant industry strides in developing consistent packaging standards, clear labeling, and resources to diffuse confusion when shifting food & beverage packaging to sustainable options. In her presentation, ILSR co-director Brenda Platt emphasized the important role grass roots composting systems play in food waste recovery. Working with the Washington D.C. Department of Parks & Recreation, the ILSR and ECO City Farms offer the Neighborhood Soil Rebuilders training program, a community composter train-the-trainer program with a community service component. Over 1,000 New York City citzens completed the Master Composting Program. According to Brenda, these Master Composters serve as community activists encouraging fellow residents to embark on neighborhood composting solutions for food waste and rebuilding the soil. Grass roots efforts, grounded in neighborhood activism, create the culture where public policy, supported by community leaders and private enterprise, may segue to macro solutions for food waste. In her presentation, Anne Bedarf with the SPC gave an update on the EPA Grant Scaling Up Composting in Charlotte, NC. The ZWA Blog article, Scaling up composting in Charlotte, details the grant goal, objectives, tasks and team members. Ei is honored to serve as subgrantee on the grant. An early lesson learned is packaging is a second step in food waste diversion programs. Grant program participants include Central Piedmont Community College, Carolina Place, IKEA and the YMCA. Ei founder Holly Elmore updated on the SFCI - Atlanta Airport implementation of the compostable packaging provision in the recent concessionaire contracts. 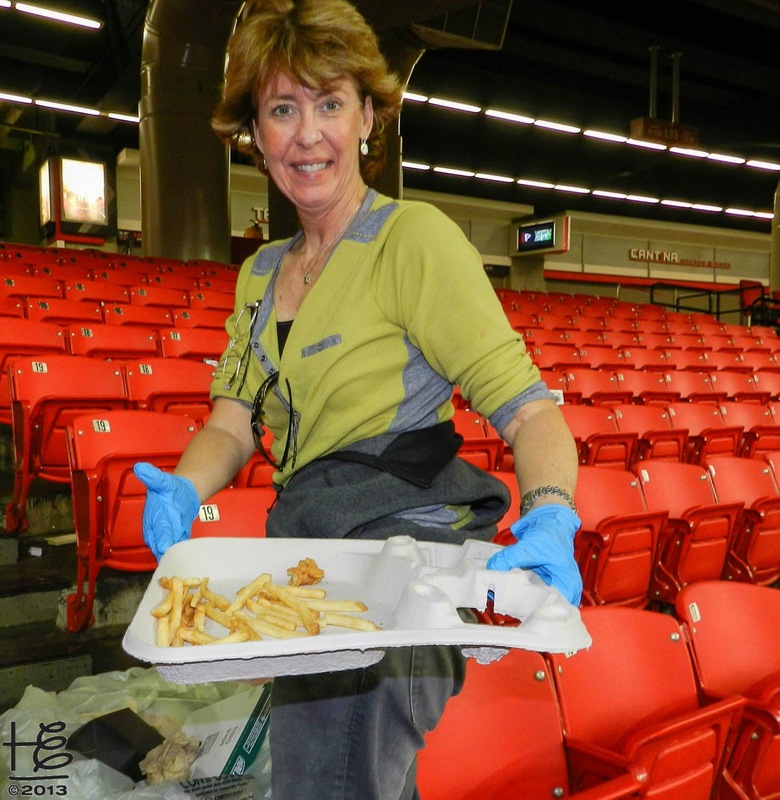 The ZWA Blog article, Atlanta Airport's Leadership Role in Compostable Food & Beverage Packaging, includes a history of the contract provision along with an overview of the October SFCI Vendor Fair. On the West Coast, CoRR brings food scrap recovery systems to multi-family buildings in the San Francisco Bay Area, and beyond. When tenants were presented with the bin and bag kits, nearly all showed a strong desire to participate in the program. Education on use of the compost end product is incorporated into the pilot. Piloting Food Scrap Composting in San Francisco Bay Area Apartment Buildings is an excellent short video of the in-progress pilots. During the labeling discussion, BPI executive director Steve Mojo mentioned a prominent compostable packaging manufacturerer received a hefty fine due to its certified compostable label. The packaging was sold in an area without a composting site within 30 miles. Thus, clear labeling for product end use is contingent upon local legislation and destinations available. BPI, USCC and FPI are jointly working on legislation for labeling of compostable products. The SPC is working on measuring access to composting facilities to check consistency with Federal Trade Commission Guidelines. In addition, BPI and USCC are working together on potential revisions to the ASTM - American Society for Testing and Materials - Standards at the foundation of the BPI compostable product certification criteria. With advancement in packaging technology and anaerobic digestion (AD) coming forth as a post-consumer food waste destination, it is time to review the standards with regards to industry evolution. 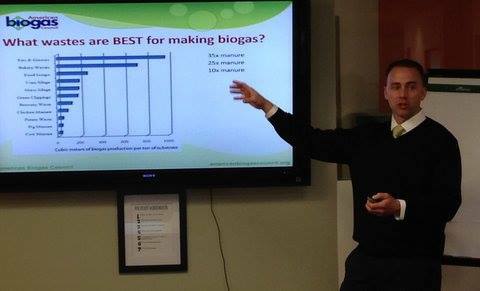 Chris Weiss with DCEN was the local hero and perfect host for the group in Global Green's shared office space. Lively discussion followed Chris' presentation on the status of local D.C. initiatives and public policy. With perfect timing, the ABC joined the meeting group to participate in evolving industry discussions. ABC Patrick Serfass executive director gave an introductory presentaiton with an overview of ABC's mission and work-in-progress. Synergies abounded and collaborative seeds were planted during breaks and intermingled within the afternoon strategy session. After a lovely lunch catered by Whole Foods Market, the afternoon strategy session began with a discussion on the group's focus and objectives. 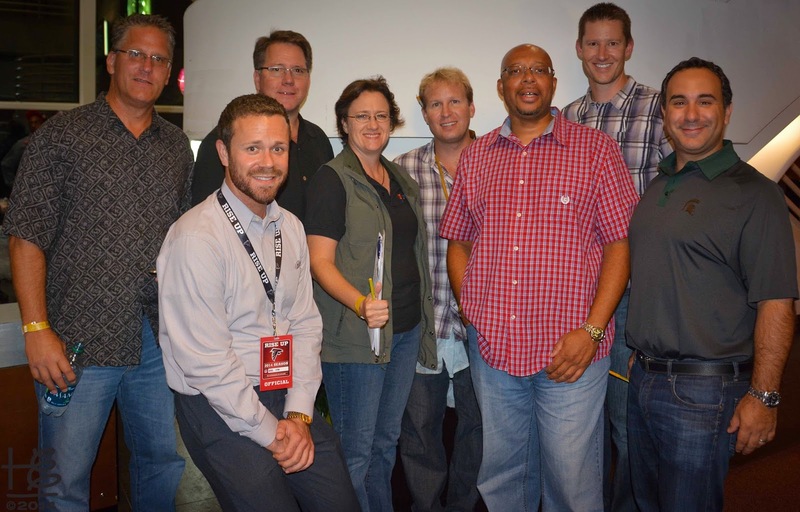 For the 2014 meeting, the focus was on increasing organics recycling in the commercial | institutional foodservice sector (includes outdoor festivals and food trucks). Curbside (residential) and retail (grocery store) organics recycling were relegated to future meetings. The NRA teams with the Grocery Manufacturers Association and the Food Marketing Institute in the Food Waste Reduction Alliance (FWRA). Targeted at retail grocery stores, the FWRA focuses on food waste reduction, donation and recycling. When the meeting focus expands to retail grocery, the NRA will invite the appropriate FWRA associates to join the group at the annual meeting. BPI Certified Products Catalogue - listing of the wide array of products BPI certified for compostability. BioCycle's FindAComposter.com - a free directory of composting facilities throughout North America. ABC Biogas Systems Map - listing of the agriculture, landfill and wastewater operational biogas systems throughout the nation; updates for food waste systems are in-process. Business case and end markets were included as one discussion topic; strong end markets for compost and biogas are the drivers to create a sustainable value chain where all parties make a reasonable profit. A SHA report is due to the State Assembly by December 1, 2015. Driving policy at the state level is key to creating strong end markets. In addition to the SHA there are many other state-run agencies | divisions that benefit from compost use. Colleges | universities, parks & recreation, and state government centers are several examples. Challenges abound in multi-tenant facilties where the foodservice operator does not control the waste | recycling contracts. In these scenarios, the tenant often pays for the organics collection yet does not benefit from the reduced landfill cost-savings. Ei's Sustainable Food Court Initiative was created in early 2011 to address the challenges associated with multi-tenant facilities. Often organics recycling programs cost more than landfill tipping fees. Post-consumer food waste recycling programs may include packaging shift costs and upgraded consumer recycling centers with new signage. In Ei's Source-Separated Materials Recycling Template (S-SMRT), a Total Materials Management Approach (TMMA) is used where materials with solid end markets (e.g. aluminum, mixed paper, certain plastics) subsidize more challenging streams generated in operations (e.g. food waste). The ZWA Blog article, Total Materials Management Approach, introduces TMMA and gives an in-depth S-SMRT overview. Processing capacity emerged as the biggest industry challenge at this juncture. Without local or regional organics recycling destinations, there is little incentive for foodservice operators to convert food and beverage packaging to sustainable options. As Brenda emphasized in her morning presentation, the Master Composter Program is a grass roots approach to building community, even neighborhood, composting destinations that bridge gaps. The master composters are educated residents who drive a public consciousness shift towards the value of organics recycling for rebuilding healthy soil. The majority of yard debris composting sites do not accept food waste. An educational campaign encouraging these facilities to accept food waste may collectively increase current capacity by a significant amount. Product labeling was introduced during Anne's morning presentation and included as a strategy session topic. Even with the significant label strides over the past year, especially with the SPC H2R label program, there is frustration and confusion with developing industry standards. How granular is appropriate for labels - should labels be on the product or only the transport packaging? As mentioned earlier one manufacturer was fined for labeling a BPI certified product compostable due to state regulations. Thus, public policy and state regulations are key to developing consistent label standards. Can national labels work with varying state regulations? False compostability claims are abundant under the auspices of oxodegradable, biodegradable and omnidegradable. Within educational materials, it is important to include a section on how to identify compostable products accepted by the organics recycling destination. The ZWA Blog article, Third Party Certification Edges Industry Towards a Zero Waste Economy, identifies BPI certification as the nation's accepted standard for compostable products. Contamination was the final topic addressed in the vibrant strategy session. Woven throughout the many topics were solutions for contamination ranging from education to labeling to industry standards. A close relationship between the food waste hauler and operator is essential to creating a clean stream. The hauler must take responsibility for the stream collected and work in partnership with the operator on creating in-house practices for contaminant-free material. As with all successful meetings, action points were summarized as part of the closure. In 2014 the group convened for the first time mid-year via a two-hour call; in 2015 a 90-minute group call will facilitate communication throughout the year. The referenced toolkits and other industry resources are loaded onto the Ei Reference Materials page for a common research focal point. Public-access documents are available for download on the page. The Ei FB album, Fourth Annual Sustainable F&B Packaging Value Chain Meeting, is a pictorial recap of the powerful meeting. In the past four years, Sustainable Food & Beverage Packaging transformed from an emerging to a maturing industry. Clarity comes forth from prior years confusion in the form of a plethora of industry toolkits, webinars and resources. Standards are developing along with the necessary structure to mature into success. Within Elemental Impact's (Ei) Recycling Refinement platform, a Total Materials Management Approach - evaluating the entire materials stream in one cost / revenue center- is used. The stated objective is true zero waste with a strong focus on ultimate material destination and the remaining "trash" within the stream. Materials with solid end markets (e.g. aluminum, mixed paper, certain plastics) subsidize more challenging streams generated in operations. Until recently zero waste measurement was quantified as diversion rates from the landfill without final destination consideration. Known for high levels of contamination, single-stream recycling - often the only recycling option available for the corporate community - results in a high percentage of recyclable items landfill destined. Thus, “true recycling rates” are often inflated with single-stream recycling programs. Note effective single-stream MRF – material recovery facilities – separation is limited by the contamination in the delivered material. Published reports substantiate curbside single-recycling programs often contain significant contaminates, which may then contaminate the corporate recycling delivered to the MRF. The Source-Separated Materials Recycling Template (S-SMRT) targets moderate material generators whose current recycling option is single-stream recycling. Grounded in on-site material source-separation and baling, the S-SMRT is developing a city-wide material recovery template with Atlanta serving as the pilot city. When evaluating recycling programs, organizations generally prepare a business case or cost-benefit analysis to ensure there is a reasonable ROI – return on investment – for the particular material stream. Hard-to-recycle items or those with little to no ROI are landfill destined without further consideration. 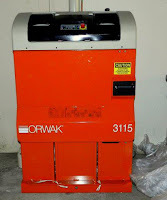 Generators source-separate material on-site and compact into mini bales. Hauler collects bales for transport to the recycling center. Recycling center associates track material received by type | generator, re-bale into standard sized bales, and store in a tractor trailer by material type until full. Hauler sells material directly to a manufacturing | recycling end destination and pays rebates to generators based on their respective percentage of the load sold. Ei oversees the system to ensure the entire value chain makes a reasonable profit. Ei Partner M-PASS Environmental serves as the S-SMRT hauler and intends to create a turnkey option for the next tier of template pioneers. With M-PASS associates baling the material there is strong control over the quality of material sent to the recycling center. S-SMRT is an evolutionary process. The 2011 Atlanta Airport milk jug recycling pilot, initiated by Ei Partner HMSHost, served as the early template catalyst. The ZWA Blog article, Milk Jugs Recycled at the Atlanta Airport, gave an overview of the S-SMRT first step. In 2012, the Sustainable Food Court Initiative (SFCI) - Shopping Mall Pilot at Concord Mills launched the first shopping mall plastic film recycling pilot; the second step in the template foundation. Ei Partner Louis Herrera of Hilex Poly was the visionary and plastic film educator during the pilot development. The ZWA Blog article, ACTION: Theme for the SFCI Shopping Mall Pilot, announced the plastic film recycling pilot. 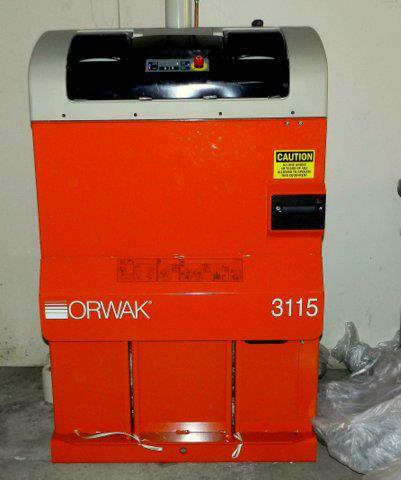 A third significant template step was the Fresh Point ATL (FPA) plastic film recycling pilot. In the ZWA Blog article, Plastic Film Recycling: A New Frontier, the plastic film recycling history, facts and the FPA pilot were detailed. Ei's first directed video, Ei Plastic Film Recycling Pilot at FreshPoint ATL, debuted in the ZWA Blog article, Plastic Film Recycling Template Video Published. When the Georgia World Congress Center joined the S-SMRT in spring 2014, the template immediately expanded beyond plastic film to total materials - a HUGE fourth step in template development. The June Atlanta Ei Partner Tours were designed as a two-day experiential strategy session for further template development. Local end market destinations Novelis and Pratt Industries hosted the first tours day. Ei Partner Novelis - the world's largest aluminum manufacturer - has an aluminum recycling plant less than 100 miles from Atlanta. On the second day tours Tim Trefzer, GWCC director of sustainability, welcomed the Ei Partners to the GWCC for a presentation of successes to date, including the 2013 "Greenest" Final Four hosted at the Georgia Dome. A back-of-house tour of recycling practices in-place followed the formal presentation. Michael Cheyne, Atlanta Airport director of asset management and sustainability, and Scott Jenkins, New Falcons Stadium general manager, joined the lunch hosted by NatureWorks and gave invigorating updates. Note the Atlanta Airport serves as the SFCI - Airport Pilot and the Georgia Dome is the SFCI - Event Venue Pilot. 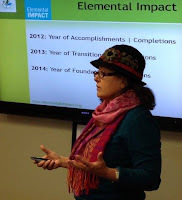 The IMPACT Blog article, Atlanta Ei Partner Tours, chronicles the powerful tours. Novelis is the Atlanta Falcons recycling partner and key to S-SMRT success. Due to contamination levels at the local MRF aluminum generated at the Georgia Dome (30,000+ aluminum beer bottles at a Falcons home game) does not meet Novelis aluminum quality standards. With their ambitious 80% recycled content goal, Novelis is "hungry" for clean aluminum and a strong S-SMRT partner. With clean material addressed, the volume is achieved through expanding template pioneers to a second tier, followed by additional tiers. Cindy Jackson, Georgia Tech recycling & waste director, attended the Atlanta Ei Partner Tours and is ready for the template business case. Ei Partner Keter Environmental Services holds the waste & recycling contracts for three Class A Atlanta malls. The intent is for the three malls to join the S-SMRT as template pioneers in early 2015. Invitations to additional template pioneers - all prominent industry leaders - are slated for early 2015. If it was easy, it would already be done - introduces the pilot & details challenges. Plastic Film Recycling: A New Frontier - gives Ei plastic film history along with a pilot update. Sustainability in ACTION at the Georgia Dome - provides a template update including the opening pre-season Falcons game fact finding mission. The S-SMRT website page lists the stellar Ei Team comprised of Lead Pioneers, Infrastructure and End Market Partners. With an initial focus on the high value materials - aluminum, mixed paper and certain plastics, the S-SMRT is destined to generate profit for participates. These profits are designated to cover costs associated with challenging material streams such as food waste. Synergistic in timing, the SFCI 2014 | 2015 stated focus is post-consumer food waste. 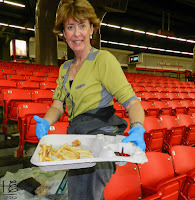 The ZWA Blog article, SFCI targets post-consumer food waste, announces the focus. Back-of-the-house (pre-consumer) food waste industry practices were perfected by early zero waste pioneers. Front-of-the-house (post-consumer) food waste remains a recycling frontier for two main reasons: 1> necessary shift in consumer-facing packaging to create clean food waste streams and 2> consumer responsibility for food waste disposal. S-SMRT profit is earmarked to cover the expense of implementing a post-consumer food waste collection program at pioneer facilities with foodservice operations. Anticipated program costs include shifting to compostable food & beverage packaging, purchasing or modifying existing collection bins, recycling station signage, and an employee training system. Once food waste is addressed, the game plan is to evaluate remaining trash and work within the supply chain for solutions. Supply chain engagement is critical to achieving true zero waste. The ZWA Blog article, Supply Chain Critical to Zero Waste Success, introduces the supply chain role in successful recycling programs along with solid examples. A Total Materials Management Approach to recycling programs is a journey well on its path. Yet challenges abound for the Ei Team to unravel into success. Stay tuned for tales from the adventure!